Custom-made We provide both custom made and pre-designed products. All products are personalised with your details. We provide custom designed products to your requirements. You can base your design off one we already stock or we can create a complete custom design. , Catalog/ off-the-shelf We have a range of designs that you can choose from. When you purchase an existing design we will add your details and provide you with proofs for you to revise until you love them. No We do not have a minimum order requirement, however prices do become cheaper when ordering over 50 or over 100. Please enquire for details and an accurate quote. Yes We love to help brides all over the world. We can provide digital files for you to print locally, or can provide the complete suite and post to you. Please enquire for a quote specific to you. Yes Please contact us for an accurate quote on postage costs. Depending on the requirements of the client and design it can take anywhere from 2-6 weeks from initial consultation to shipment. Products that are based on a pre-existing design usually take 2-3 weeks, custom designs can take 3-6 weeks depending on revisions complexity. Please let us know if you are in a rush and we will try to accommodate your request. As mentioned above, it can take anywhere from 2-6 weeks for your order to be designed, printed and shipped. We are happy to take orders as far in advance as you wish, however we prefer orders to be placed approximately 2-3 months in advance as this allows time for revisions and for you to carefully consider all aspects of the design so you get a final product you absolutely love. We provide a complete service from engagement through to thank you cards after the wedding. 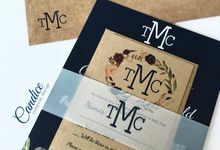 We can assist with the design and production of all stationery and signage requirements, allowing you to deal with one vendor rather than many. We absolutely love seeing a vision come to life and enjoy providing premium personalised customer service. We provide obligation free quotes and consultations and can't wait to help you with your request no matter how big or small. We require a 50% up to a maximum of $100 deposit within 7 days of order, with the remaining balance due prior to print. We are a relatively new business, being established at the start of 2017. 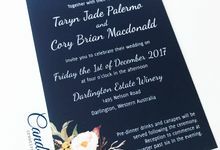 We do however have years of experience in designing and printing invitations and paper products. 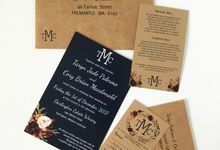 At Candice Creative Design we specialise in invitations, stationery and signage for your big day. Any paper-based or sign-based requests and orders are welcome. We enjoy all creative projects (especially custom creations) and love to bring your idea to life. We can help you from announcing your engagement, right through to sending thank you cards after the big day. Please contact us for an obligation free quote, including face to face meeting in Perth or via Skype/Zoom.